Brighter Vision is the ultimate web solution for therapists. We do so much more than simply build you the most beautiful and mobile-friendly website your private practice has ever had. We power up your site and your practice with the strongest online marketing features for therapists, including access to advanced marketing features created exclusively for Brighter Vision customers. To top it all off, every website receives free SEO help and tech support for life. 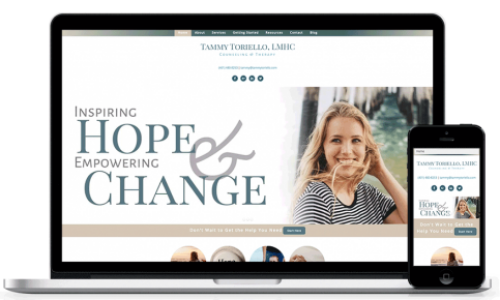 Whether you’ve had your website for five days or five years, our expert support team is here to help you with anything and everything – from increasing your site’s visibility to potential clients, to helping you post photos to your blog. With Brighter Vision, you get a polished $5,000+ website for a fraction of the cost with none of the headache. Ready to take your private practice to the next level? Click here to get started. Everything your practice needs to succeed on the web, delivered in a perfectly simple solution. Complimentary support is included for life. No extra cost. We’ll customize your site with your branding, images, colors, fonts, textures and more to give you that ‘custom’ look at a fraction of the price. Our sites are 100% mobile responsive and designed to make it easy for potential clients to contact you. All our websites receive an annual Search Engine Optimization audit by one of our SEO experts (Audit also performed when we build your site). You’ve absolutely been AMAZING every step of this process. I am so thrilled with my new branding and I have you to thank for making it so easy and dare I say, enjoyable! Seriously – this is an incredible company that offers personalized website creation and SEO help at a VERY reasonable price! Honestly, when they told me the cost, I assumed that the site would still look very cookie-cuter… This was so not the case!! I am SO in love with my site!! It is such a great representation of my company, and they worked with me extensively with any changes I needed. They allowed me to be creative and actually encouraged me in it! They found a way to make it work specifically for me and what I wanted. I would 100% recommend Perry and his team. I worked specifically with Andrew and LOVED him! Super super great! Let me start off by saying – YOU ROCK! Thank you for creating this beautiful website! Switching over to Brighter Vision is by far the best business decision I’ve made.